The moisture condition of solid brick and sandstone walls of historic buildings may be examined and monitored non-destructively and effectively by means of a novel combination of test methods which provide useful information on planning and monitoring rehabilitation and maintenance measures. Results are presented of an interdisciplinary research project of BAM on the moisture balance in the main cornice area of the Berlin Zeughaus. The main part of the investigations was carried out in 1994 and 1995. The quality of the prognosticated drying out process has been verified annually by means of measurements up to 2002. The depth-resolved local moisture determinations were accomplished with a microwave method developed by BAM. The moisture profiles revealed excessive moisture in the building element and reflected the slow drying process. Additionally, endoscopic examinations and chemical and physical analyses of miniature samples were carried out as well to help interpret the results. Hygrothermal data could be calculated from the quasi non-destructive tests and the parameters determined by the laboratory tests. Based on the 1995 measured moisture profile in the building element, the predicted simulation calculation indicated that a relatively long drying out process must be anticipated. Therefore the planned waterproofing sealing can at the earliest be applied to the surface of the building element in 2005. The good correlation of predicted and measured moisture profiles of the past years demonstrates the high quality of the new combination of test methods. The Zeughaus is the oldest building on the street "Unter den Linden" (Fig.1). It was constructed from 1695 to 1730 and counts as one of the most attractive secular Baroque structures of North Germany . Fig 1: South view of Zeughaus Berlin 1992. 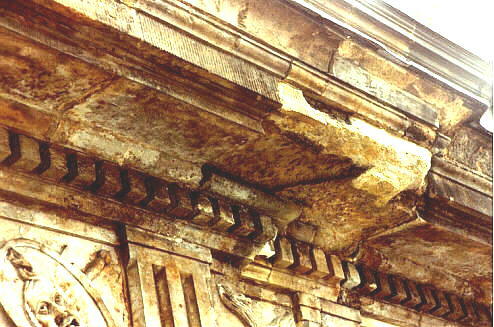 Fig 2: Resulting damage in the main cornice due to moisture penetration. During World War II, the Zeughaus was badly damaged. The reconstruction followed from 1948 until 1965, whereby construction errors nevertheless occurred whose subsequent damage can still be visible until in the last years. This concerns among others faulty constructed formation of the roof drainage system, by which the flow of rainwater from the roof partially occurs directly over the multipart main cornice of sandstone. Because of the leaky connectors and joints on the roof sheathing, considerable moisture could penetrate this structural element which led to salt efflorescence and joint destruction on the exterior sandstone surface (Fig.2) . The repair work then began in 1991. Next the reasons for the moisture absorption were cleared and additional supporting measures were adopted for accelerated drying out of the eaves area. The moisture investigations of BAM began in May 1994. The aim of BAM investigations was the analysis of drying out process in the main cornice area by moisture measurements and prognostic hygrothermic simulations. This made possible on the one hand to control the suggest of drying out measures so far taking place and on the other hand to determine a suitable point in time for conservation and colored coating of the sandstone surface. As agreed upon, at least one measurement point was arranged for the major moisture infiltration of the main cornice of the fourth floor. The vertical arrangement of the measurement points in the examined eaves area is shown in Fig.3. Each measurement point consists of a bore-hole pair for moisture measurements with the microwave method. The bore-holes have a diameter of 12 mm and a distance of 50 mm. Fig 3: Vertical cross section of eaves area with measurement points M1 and M5. A detailed presentation and discussion of the results follows within the scope of this exemplary section for measurement point M1, since the moisture condition is representative for this structural element. A special test program was developed and applied (Fig.4). The accomplished main part of the test program in 1994/95 consists of three emphases: the quasi non-destructive structural investigations, the laboratory examinations and numerical simulation computation. The components of the quasi non-destructive structural investigations are moisture measurements using the microwave method and endoscopy for determining the wall construction. The laboratory examinations of miniature samples were obtained from the bore-hole pair for moisture determinations using the microwave method. They include on the one hand the unique moisture measurements in the structure using the dry weight method and on the other hand the determination of selected material characteristics. Of special interest thereby are the hygroscopic parameters, the pore-structure characteristics and salt analysis. The association of results from the non-destructive structural investigations with those from laboratory tests allow to conduct numerical simulation computations. The additional integrated control-examinations in the test program from 1996 to 2002 contain repeated moisture measurements with the microwave method. They enable a comparison of predicted with the measured course of drying out and so allow conclusions according to the quality of the simulation calculations of 1995. The main component of both parts of the test program was the microwave method. This method allows a local repeatable determination of moisture profiles on-site to monitor the drying out process on the one hand and to get initial conditions for the simulation on the other hand. Fig 5: Test setup of microwave method. The measurement principle of this method is based on the absorption of continuous microwaves in the frequency range of 6 to 8 GHz by moisture in masonry. The sketch in the figure 5 shows the test setup. There you can see on the left side the test equipment and on the right side the horizontal cross section of the masonry with two parallel bore-holes. In these bore-holes two wide-band antennas are moved step by step. If the antenna pair is not moved then the attenuation between transmitter antenna and receiver antenna is measured. A quasi-optical model realizes the conversion of the measured attenuation values into moisture contents. A typical moisture profile measured by microwave method in June 1994 is shown in the figure 6 (black curve). A comparative consideration with quasi-simultaneous measured moisture profile using the dry weight method (grey curve) shows that both curves have a good agreement. The partially existing quantitative deviations are primarily caused by various measurement volumes. The microwave method investigates the moisture condition between both boreholes. The dry weight method considers the material volume in the bore-hole. Fig 6: Moisture profiles measured by microwave and dry weight method . The moisture profile determined with the microwave method illustrates a very differing moisture distribution over the bore-hole depth. This is caused mainly by the wall construction (Fig. 7). Fig 7: Connection between moisture profiles and wall construction . The horizontal wall cross section reconstructed by endoscopy is characterized by brickwork on the inside and sandstone on the outside. A comparative consideration of the moisture profile and the wall structure shows that materials having an identical pore structure also show a uniform curve course, while a change of different porous materials can lead consequently to a point of discontinuity. That latter for example is in regard to the local transition from porous brickwork with a moisture content of ca. 25 volume% to the considerably dense Postaer sandstone having ca. 8 volume%. The characteristic absorption isotherms shown in Fig.8 of the building materials used in the main cornice however indicate that the existence of these discontinuities is strongly dependent on the moisture content. This shall be explained in the following sentences, as an example for masonry brick and Postaer sandstone in the area of a super-hygroscopic soaking. This is bordered below by the maximal hygroscopic moisture Wh (95% relative humidity) and above by the free water saturation WS (100% relative humidity). The determination of the absorption isotherms in this range requires the experimental evaluation of the saturation potential curve and next the transformation of the saturation potential to relative humidity with the aid of the Kelvin equation. With a high super-hygroscopic soaking (>97% relative humidity), the bricks show considerably higher moisture content than the Postaer sandstone which consequently results in discontinuity in the moisture profile (Fig. 7). The arrows in the figure 8 mark the 1994 measured moisture condition of the sandstone and brickwork in the interface area. Fig 8: Characteristic absorption isotherms of selected building materials. If the relative humidity would be ca. 97%, then both materials would have had the same moisture content and therefore would not differ in their moisture profile. With a further decrease of the super-hygroscopic soaking, the masonry brick would have less moisture content than Postaer sandstone which would again result in a discontinuity. It is furthermore noticeable that a minor variation of relative humidity leads to a great super-hygroscopic soaking in masonry brick, which results in the greatest moisture fluctuations. This also finds expression in the moisture profile measured in 1994/95 with the microwave method (Fig.7). So the greatest variation of the moisture content is seen in the high super-hygroscopic soaked bricks which are directly behind the sandstone. Generally it must be stated however that from 1994 to 1995 the drying out process went very slowly. The association of the results from quasi non-destructive investigations already presented and the laboratory analyses described in detail in  and  made it possible to carry out numerical simulations. The aims of these simulations were the determination of a suitable point in time for conservation and colored coating of the sandstone at a model arrangement on the one hand and the prognostic estimation of the drying out process at a real arrangement on the other hand. The simulations were realized in 1994/95 by a model of TU Dresden developed by Häupl and Stopp . For the one-dimensional numeric computations performed at the real arrangement, whose results are shown in Fig.9, the first moisture profiles determined with the microwave method on 2 June 1994 were taken as a starting point. Following a period of 9 months, the data measured on 13 March 1995 can be directly compared with the calculated moisture contents and generally show a good agreement. The existing deviations can be explained among others due to the partially restricted availability of representative parameters, inhomogeneity of the individual materials along the boreholes and inaccurate knowledge of the material composition between the bore-hole pair, especially in the bed joint area. The predictive part of the calculations to 2007 indicates a slow drying out of the construction element. Thereby the drying effects are greatest in the interior with a reduction up to 8 volume%, and are least expressed in the sandstone area, so that especially here a longer drying out period must be taken into consideration. Fig 9: Results of the simulation calculation at M1. To estimate the ideal time for the various surface treatments of sandstone, additional simulation calculations were performed on a model design which was adequate to measurement point M1. As an initial requirement, it was assumed that a free water saturation existed in sandstone and masonry brick. The constant accepted marginal conditions in the interior were 20°C and 50% relative humidity as well as externally 8.6°C and 8% relative humidity (annual median value in Berlin). Three treatment conditions of sandstone were taken into account with the calculations (Table 1). Table 1: Treatment conditions of sandstone surface. Loading factor 2 thereby corresponds to the moisture state of the actual configuration. To illustrate the influence of the type and point of time of the surface treatment on the drying out process, Fig.10 shows the average moisture content in sandstone related to time. Proceeding from the drying out behaviour of untreated sandstone (solid black curve), it is shown that its early surface treatment (loading factor 1) is limited as to time with sole conservation, and the additional sealing using colored coating leads to a long-term great impediment of the drying out process. For this reason, the outer marginal area of sandstone must not be subject to any surface treatment when it has a high super-hygroscopic soaking. Fig 10: Temporal course of average moisture content in sandstone with and without surface treatment. A sole conservation of the sandstone surface at a later point of time (loading factor 2) prevents the drying out to a failing negligible degree, while a following colored coating further impedes the anyway slow progress of the drying out process. Noticeable thereby are the short and long-term effects on local moisture enrichment in sandstone following the various surface treatments (Fig.11). Fig 11: Moisture profile in sandstone with and without surface treatmentof weakly wetting marginal area. So it is shown here that an additional sealing colored coating of the sandstone surface, in the observed period of three and one-half years, depends on the moisture content directly behind the conserved marginal area. This again allows a long-term capillary moisture transport in this area and consequently makes possible a salt enrichment. To prevent the following damage resulting therefrom, the sealing colored coating of sandstone should be delayed for a long term (until 2005) based upon the actual scheme. This recommendation makes allowance for the building owner and restoration planners. So the restoration measures already accomplished were exclusively restricted to a conservation of sandstone in 1995. A comparative observation of predicted and measured average moisture content on the overall measurement depth for the measuring period to 2002 is revealed in Fig.12. Fig 12: Predicted and measured temporal course of average moisture content at M1. In the observed period of 8 years, principally a good qualitative but also quantitative agreement between calculation and measurement is detectable. So in both curves a reduction of the rapid drying out with increasing time can be recognized and underlines once again the lengthy drying out process. The observed deviations of the average moisture contents, especially at the start of the briefly repeated measurements of the average moisture contents, are probably caused by the prior described seasonally dependent vertical surrounding moisture processes in the multipart main cornice area. These could nevertheless not be taken into consideration with the one-dimensional calculations. Finally it can in all be established that the microwave method developed by BAM as well as the new methodical combinations based on the moisture measurement method have proven their merit in a practical application. This gives the reconstruction planner a new possibility to determine moisture condition in the compact brick and sandstone masonry of historical buildings non-destructively by measurements, prognostical estimations and monitoring. We express our thanks to the Bundesamt für Bauwesen und Raumordnung for providing the interesting task assignment and for the financial support of this project. Furthermore we would also like to thank our colleagues of the division "Non-Destructive Damage Assessment and Environmental Measurement Methods" and division "Building Materials" at BAM.